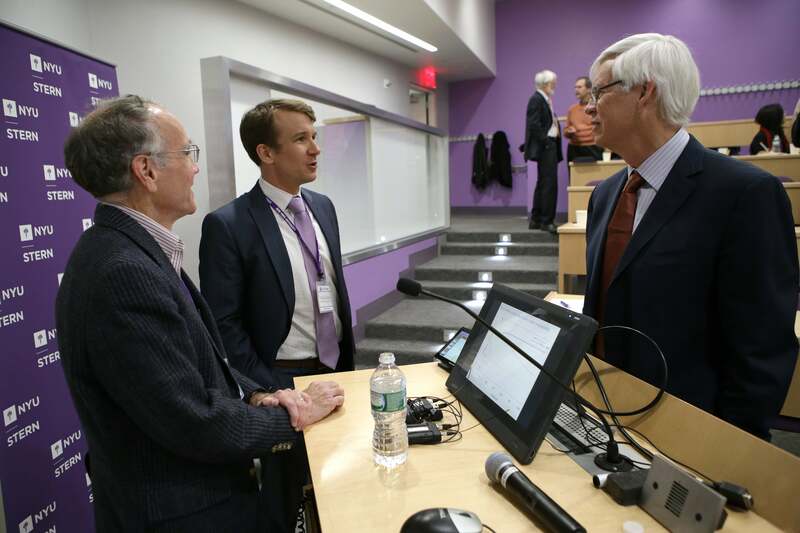 The Volatility Institute hosted its seventh annual conference on April 24, 2015 titled "Fixed Income Risk: Measurement, Modeling and Management." Click here for the Sixth Annual Volatility Institute Conference Program. You can view photos from the event here. Keynote Speaker James Hamilton (left) having a conversation with discussant and co-author Michael Bauer and conference host Robert Engle. After six years of essentially zero short rates and three rounds of Quantitative Easing, it is challenging to predict the risks facing fixed income portfolios and businesses. This conference will focus on research that will measure, model and manage these risks. Topics include the zero lower bound on rates, monetary policy after QE, volatility models of the term structure, European policy, policy uncertainty, fixed income microstructure, macro risks, and the overall implications for financial stability. There will be a keynote address and a practitioner panel. "Monetary Policy Risks in the Bond Markets and Macroeconomy"
"Local-Momentum Autoregression and the Modeling of Interest Rate Term Structure"
"Staying at Zero with Affine Processes: An Application to Term Structure Modelling"
"Interest Rate Uncertainty and Economic Fluctuations"
"Is the US Economy Vulnerable to a Volatility Shock?" "A Probability-Based Stress Test of Federal Reserve Assets and Income"
"Do Distributional Characteristics of Corporate Bonds Predict Their Future Returns?" Discussant: David Greenberg, BlackRock, Inc.
"Nonlinearity and Flight-to-Safety in the Risk-Return Tradeoff for Stocks and Bonds"
David Greenberg, Managing Director, BlackRock, Inc.